There are a number of ways to remove turf from an area for replanting, this is a quickish way that allows for planting immediately. Very often when putting new plants into the garden or planting up a new bed, tree, shrub etc. the first step is to remove some turf to make way for your new introductions. Removing existing turf is hard work, but if you follow this technique, it becomes easier than the ways in which I've often seen people try to deal with it. The first thing to appreciate is that you don't need to dig down very far, grass is a greedy plant, but it does this by intercepting water and nutrients as they are added to the soil. there are some deep roots, but most of the plant is in the top couple of inches of the soil. So you only need to scrape away about an inch of soil to remove the grass completely with much of the roots too, if you do this it won't be able to grow back again. Step one is to use a spade or lawn edger to cut through the grass a line that limits where the edge of your new bed is to be, go down 2-3 inches. You might be able to do this by eye as I am here, or you may want to use a straight edge or string and peg for circles. If you need to mark the grass out use flour, it's cheap, non-toxic and temporary, being brushed away or watered in quickly. 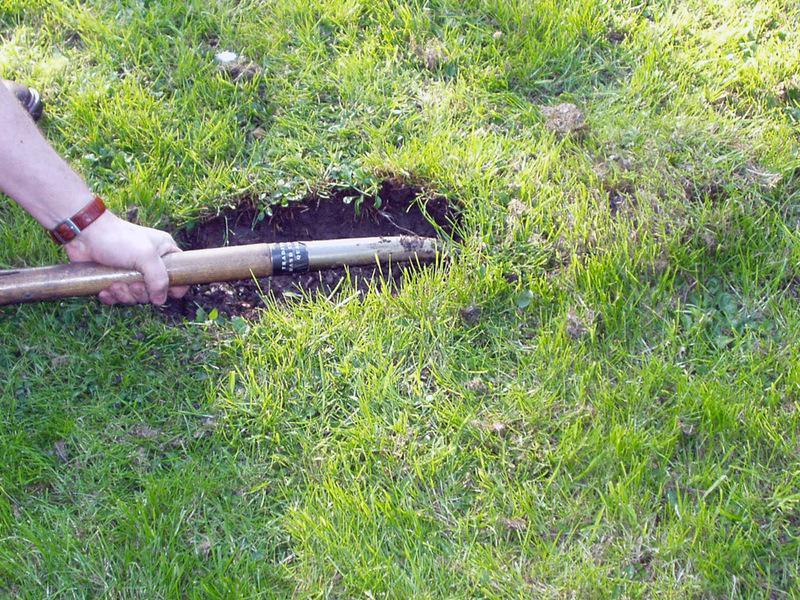 Once you've marked the line by cutting through to about 2-3 inches down, insert the spade at about 45 degrees and then tilt it downwards to cut forwards at a depth of about an inch under the soil. The spade should be turned to become flat. If you're right-handed, then your right hand on the spade handle will supply the effort to do this while your left hand steadies the spade near the blade. 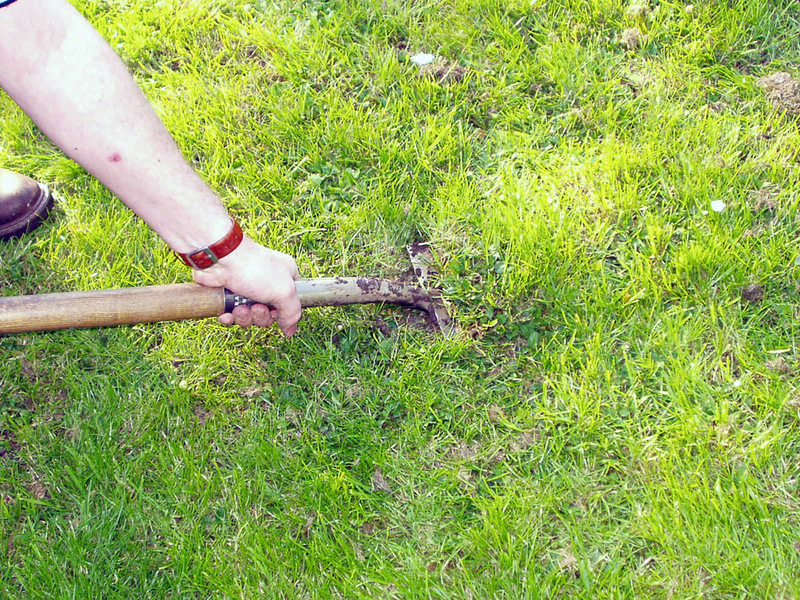 A series of short, sharp back-and-forth stabbing movements are most effective to get the spade cutting the soil and grass roots rather than a continuous force, sharpening the spade before you start will help. 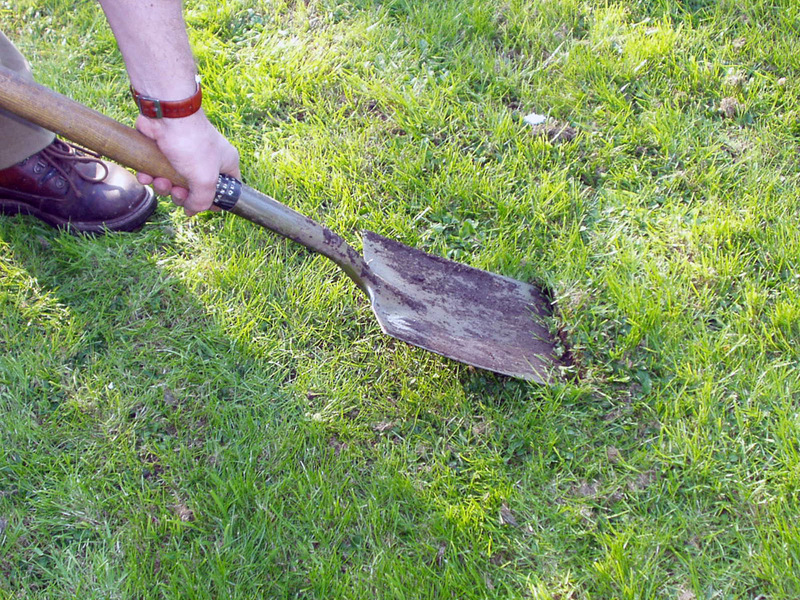 Once the spade is horizontal, continue the stabbing motions to go further under the existing turf. 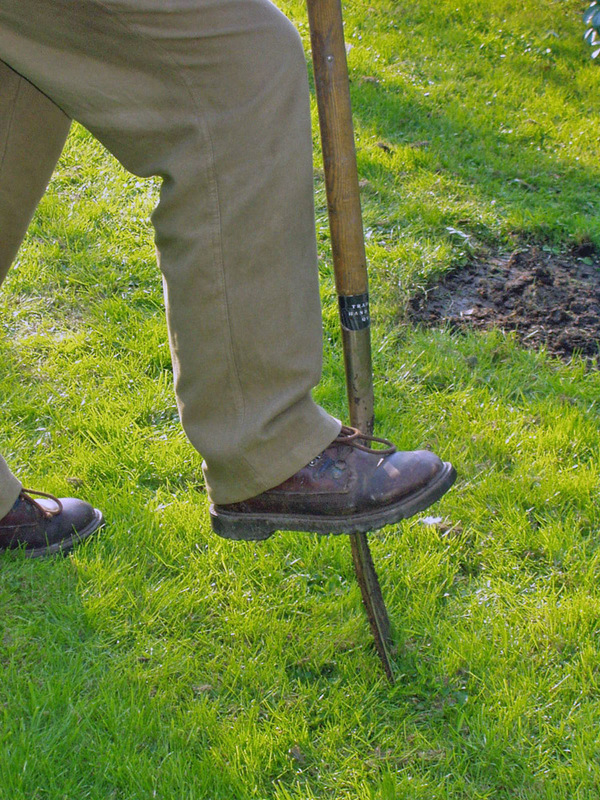 Once the whole spade is under the turf and horizontal, use the "heel" of the spade - the part of the blade where it meets the handle - to keep it steady and determine the depth. What you want to avoid is digging great clods on earth up with a bit of grass on top, this is very hard work and removes large quantities of soil that you then have to do something with - and probably replace too. Ideally the soil should be fairly moist, not dry so it's hard, and not wet so it's sticky and difficult to force the spade through. 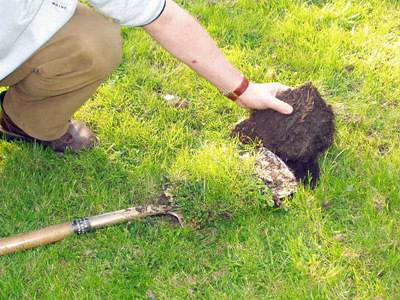 You do need to be reasonably strong to remove turf this way, but if even if you're not, a small area for a tree or shrub can be stripped in a relatively short time - it's very important to cut the edge as in the first step, so that you get the edge to the area that you want. When you've gone about one or two spade lengths under the turf, tilt the spade sideways or front to back to rip the turf you've separated and rip it off from the rest. Repeat until you've done it all. Removed turf - you'll have loads of this, pile it up out of the way somewhere with the grass side down, water it well with several watering cans worth and cover with old carpet or something and weight it down - bin bags at a pinch. In 6 months it will be ready to use as a mulch or to dig into the soil. The more grass in relation to soil the better. It is possible to re-lay this turf, but you have to lift it carefully, even then you will find that it's a case of having mosaic pieces with varying backing soil thicknesses,rather than continuous strips, so useful to repair small areas of damage but not to lay as extensive areas of turf elsewhere. While this is quite hard work, the advantage is that you can plant into the stripped area immediately, dig it over and then plan your planting before you start, especially if there are a number of plants that are going into the space. Weedkiller - use a glyphosate containing weedkiller to kill grass in the area you want. Glyphosate is neutralised on contact with the soil and so what doesn't fall on plant leaves won't cause any damage. Make sure you DON'T USE PATH WEEDKILLER as this stays in the soil and carries on killing any plant life for months after application. It will take 2-4 weeks depending on time of year for the grass to die off, the dead grass needs to be dug into the soil before planting up. The advantage of this is that it is relatively low effort but it does use chemicals and you need to wait before you can start planting. Good for large areas though, especially if you have or can hire a rotavator to dig it all over afterwards. 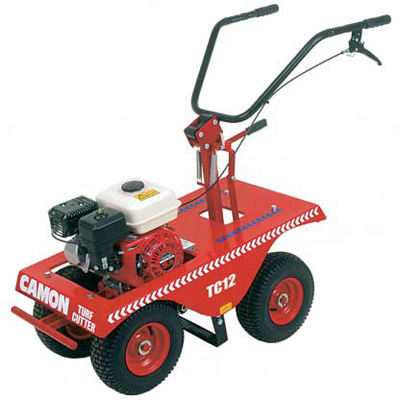 Turf stripping machine - There are several designs of machine to lift turf, the most commonly encountered are petrol driven large lawnmower sized machines that have 4 wheels and a square U-shaped blade between them that vibrates rapidly back and forwards an inch or so beneath the soil, so separating it from the turf. They do the same sort of job as the spade in the manual method above, but are powered and so much easier. They can still be quite an effort to use however and can be heavy work to manoeuvre around, especially on slopes or if there's a lot of change of direction, they like going forwards and not turning. I have sweated mightily while wrestling these machines around gardens. If you have a large area to strip they are invaluable, hire them by the week, day or half day from tool-hire centres. If you want to re-lay the turf you have lifted, you could hire a "professional machine". The most common turf cutters like the one in the picture result in turf that is rather messy and can't really be re-laid again, it's best composted as it's all chewed up in irregular sized pieces. Professional turf cutters are a little more expensive, though not a huge amount - maybe £100-120 a day as opposed to £70-90. They are larger and heavier, but most importantly, they can remove the turf in rolls that are able to be laid again elsewhere rather than having to deal with the lifted turf or buy some in, so it could be the most economical deal. To do a good job, they need a straight run with some space in front and at the end of the run for turning, so only really useful for a large area with no obstacles. 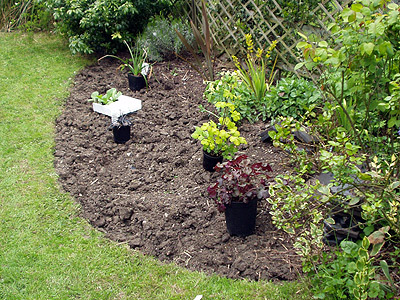 They will struggle to do a decent job for re-laying if the ground is not flat and/or if the soil is very heavy. If you do use the turf elsewhere, then plan things so the lifted turf has the minimum amount of time before it is put down again - ideally immediately, certainly within 24 hours or up to 48 hours if you don't mind it looking ill for a while. Rotavator - An efficient way of removing turf over a large area, though it needs a heavy duty machine which will be difficult to manoeuvre in small spaces, they will probably be more expensive to hire than a turf stripper too. The turf will be totally destroyed and it will need to be raked up and disposed of afterwards, will require several passes to completely remove the turf from an area, though of course the soil is rotavated at the same ready for planting. Q. I have a large patch of lawn damaged by my boys playing football in wet weather. I am going to put down some astro turf in one corner to keep them off it. I am taking up some turf - circa 12m sq in a different part of the garden. Do you have any thoughts and tips on how to go about digging up the existing lawn to enable me to relay this. A. If you don't have access to a turf stripping machine, dig it up, chuck it away and buy new for the new area. You could try re-using it, but you'll probably end up just putting in a lot of effort to make a big mess. Depends how energetic you're feeling, the turf strippers tool hire firms do save a lot of time and effort, but it's a bit like stripping wallpaper as to what you get from them. 12m sq is not a very large area and so is uneconomical to hire a professional turf stripper. Q. I have just dug up a large section of my lawn to make a flower bed and am wondering if there is anything I can do with my excess turf, i.e build a bank with it or is there a way to rot it down to use as a compost? A. Turves make good compost, pile them grass side down out of the way somewhere and cover with old sacks / carpet / weighted down bin bags etc. to keep the light out. By autumn, they should have made good garden compost.